Italy was home to the Nuragic civilisation on Sardinia and Corsica who produced some of Europe's finest megaliths. In addition, it mothered the enigmatic Etruscan civilisation, and finally, it produced the mighty Roman Empire, which held dominance over the greater part of the world for 1000 years, retaining authority over millions through the Holy Church of Rome to this day. This is the second largest island in the Mediterranean. The history of Sardinia goes back to the Palaeolithic, but it was permanently settled from about 6,000 BC. 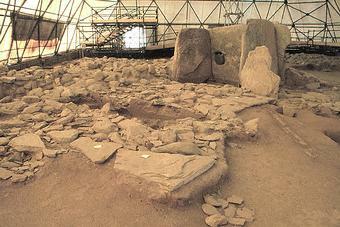 The 'Giant's Tombs' and 'Nagurhi' are some of most spectacular prehistoric constructions in the Mediterranean. During their heyday, the Etruscans controlled a large part of Italy and the Mediterranean. They borrowed the Greek alphabet, but spoke a different language (still un-deciphered). They physically laid the foundation stones for the Roman empire in Rome. But who were they and where did they originate.? Located in the Alps exactly (and probably deliberately) on the watershed of the Piccolo San Bernardo mountain pass between Italy and France. This important stone circle dates back to the 2nd or 3rd millennium BC. 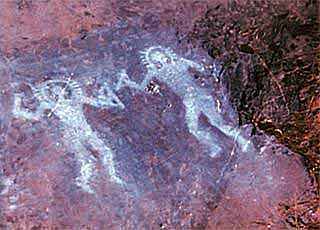 Valcamonica has one of the world's greatest collections of prehistoric petroglyphs. This valley hosts more than 300,000 symbols and figures carved within the rock over a period of 8,000 years and depicts themes connected with agriculture, navigation, war and magic. 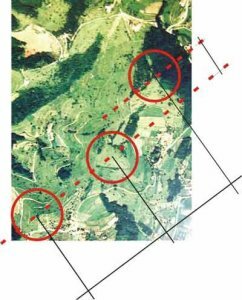 Three 'pyramids' were discovered thanks to satellite and aerial imagery in northern Italy, in the town of Montevecchia - 40 km from Milan. They are the first pyramids ever discovered in Italy and the dimensions are quite impressive; the highest pyramid is 150 meters tall. They are stone buildings, as recent excavations have proved. 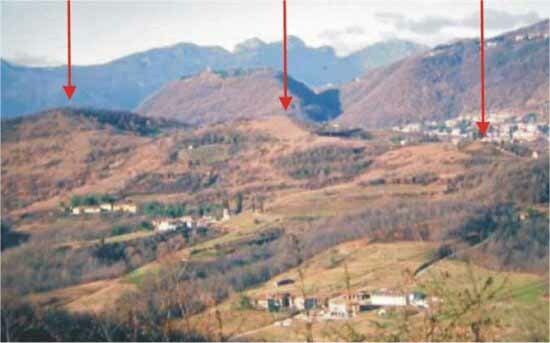 However, they are now completely covered by ground and vegetation, so that they now look like hills. The inclination degree of all the three pyramids is apparently 42° 43' (As seen on the 'Bent' and 'Red' pyramids at Dashur) and it has been suggested that there is a perfect alignment with the Orion constellation (a suggestion which appears valid, if the photo - right is correct). There appear to be similarities with the Egyptian pyramids. At the moment, little is known about their origin or age. Article: DailyMail. (Feb, 2007) - ROME. Two 5,000-year-old skeletons have been found locked in an embrace near the city where Shakespeare set the tale ROMEO AND JULIET. 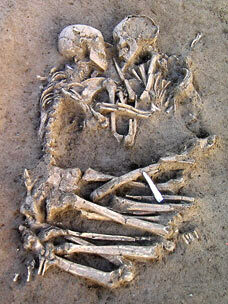 At present, they are the only couple found embracing from the Neolithic. Archaeologists unearthed the skeletons dating back to the late Neolithic period outside Mantua, 25 miles south of Verona, the city of Shakespeare's story of doomed love. Buried between 5,000 and 6,000 years ago, the pair are believed to have been a man and a woman and are thought to have died young, because their teeth were found intact, said Elena Menotti, the archaeologist who led the dig. "As far as we know, it's unique," Menotti said. "Double burials from the Neolithic are unheard of, and these are even hugging." An initial examination of the couple - dubbed the Lovers of Valdaro - revealed that the man (on the left in the picture) has an arrow in his spinal column while the woman has an arrow head in her side. The monuments at Saint Martin de Corléans, which date back to the 3rd millennium BC, indicate that it was a very important place for several thousand years. The construction of the site began between 2,000 and 4,750 B.C. with the planting of a series of wooden poles. Before this planting, the ashes of burnt ox skulls were spread at the bottom of the pits that held the poles. 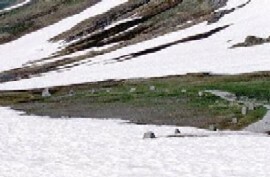 The various rows of poles are aligned towards a rock on the mountain in front of the site. The most likely explanation for this alignment is that the ancient inhabitants of the valley noticed that the rock in question just hides the Moon on the rare occasions when it dips to its lowest angle below the celestial equator. The second phase (2,750-2,400 B.C) started with an extensive ritual ploughing, whose lines are parallel to the orientation of the wooden poles. The ploughed area yielded a large number of human teeth, apparently planted as though they were seeds. Several statue-stele (human figures carved on big stone slabs) were also erected in the same period. Some of these were aligned with the poles and the ritual ploughing, while others were set at right-angles to the alignment. In addition, a number of standing stones, stone platforms and at least seven big ritual pits were added during the same construction phase. The third phase, between 2,400 and 2,100 B.C., saw the construction of a big dolmen (2.5 x 2.2 m, or about 8.2 x 7.2 feet) with a side entrance and a 15m (49 feet) triangular stone platform, followed by a second smaller dolmen, an allée couverte (a tomb that looks like an elongated dolmen) and a circular tomb. All these monuments were left without a covering mound, just like the Caucasian and Palestinian tombs. The tombs at Saint Martin de Corléans are usually aligned to local astronomical points, in particular the sunset at summer solstice and the moonset when the Moon reaches its northernmost position. Several smaller tombs were built during a fourth construction phase (2,100-1,900 B.C). The site was then deserted for about 700 years, but from 1,200 to 800 B.C. was again used as a burial ground. Rome: Home of the Obelisk. The city of Rome currently harbours the most obelisks in the world. 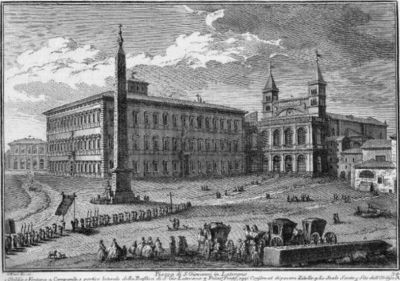 There are eight ancient Egyptian and five ancient Roman obelisks in Rome, together with a number of more modern obelisks; there was also (until it was returned in 2005) an ancient Ethiopian obelisk from Axum in Rome. The tallest Egyptian obelisk is in the square in front of the Lateran Basilica in Rome at 105.6 feet tall and a weight of 455 tons. (Sardinia) 36 Tombs, Carved 'Trilithon' doorways. Stone Circle on the border of France and Italy. Sardinia. The 2nd largest island in the Mediterranean.